Saying goodbye to an old friend can be daunting. But pulling the plug on an outdated refrigerator or dishwasher might save you money; new appliances are often considerably more energy-efficient. A new refrigerator consumes 75 percent less energy than a 1970s model. Replace a vintage clothes washer and save $60 on utility bills and nearly 5,000 gallons of water a year, according to the Association of Home Appliance Manufacturers. Not every new appliance is a good bet; always look for the ENERGY STAR label. It signals energy-efficient models. Ready to save? Walk through your home to find opportunities to pull the plug! 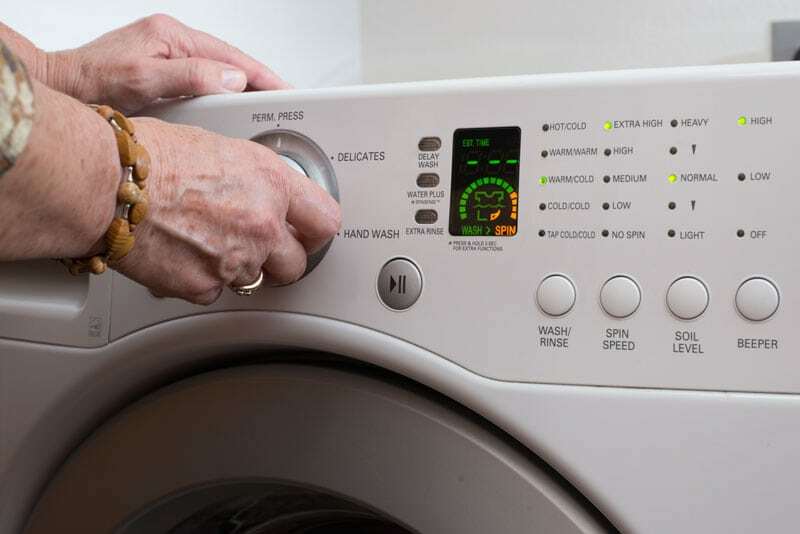 In the laundry room, a full-sized ENERGY STAR-certified clothes washer uses 15 gallons of water per load, compared to the 23 gallons used by a standard machine. During the machine’s lifetime, this saves 27,000 gallons of water. Replace your kitchen’s classic refrigerator with an ENERGY STAR-certified model to save between $200 and $1,100 in lifetime energy costs. Today’s average refrigerator uses less energy than a continually lit 60-watt light bulb. Resist the urge to move the old refrigerator to the basement or the garage. Instead, say goodbye and recycle the energy-guzzler. Televisions might be a little more baffling. As screen sizes increase, energy consumption may also rise. You can still be a savvy shopper. ENERGY STAR-certified TVs are about 25 percent more efficient than conventional models. LED screens use 20 percent less energy than LCD TVs. Once you purchase a TV, calibrate it by adjusting the contrast and brightness to a moderate level. By default, new televisions are set to dynamic, high-contrast settings. This consumes more power than standard, lower-contrast settings. Attached to old appliances? You can still save with smart settings. For example, heating water creates the greatest expense when washing dishes or clothes. Set your water heater at 120 degrees and be sure your clothes washer or dishwasher is full whenever used. NOT TOO COOL FOOD: In the kitchen, don’t keep your refrigerator or freezer too cold. Recommended temperatures are 37 to 40 degrees for the fresh food compartment and 5 degrees for the freezer section. TOAST, DON’T ROAST: Use toaster ovens or microwave ovens for small meals rather than your large stovetop or oven. AIR DRY DISHES: Use the dishwasher’s “eco” option or use a no-heat air dry feature. Scrape food pieces off the plates, rather than rinsing them. COLD CLOTHES: In the laundry room, wash your clothes in cold water using cold-water detergents whenever possible. Adjust load settings for smaller loads. LOSE LINT: Clean the lint screen in the dryer after every use to improve the dryer’s efficiency. Find out how little changes add up to big savings at www.TogetherWeSave.com. Luann Dart writes on energy efficiency issues for the National Rural Electric Cooperative Association, the Arlington, Va.-based service arm of the nation’s 900-plus consumer-owned, not-for-profit electric cooperatives.